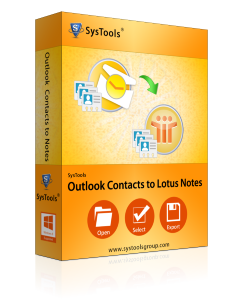 The tool aids to convert Outlook Contacts to Lotus Notes Address Book. Any number of contacts saved in PST file will be migrated into Names.nsf file which is importable in IBM Notes client application. The software has auto-detect PST file option which automatically add configured PST files and provide user with an option to export contacts from any of them. Select any of the mailboxes and convert its contacts into Notes NSF file. If users have contacts saved in different Outlook PST file which is not configured in MS Outlook then using Outlook Contacts to Lotus Notes converter they can convert its contacts in Notes NSF file effectively. When users choose to export contacts from Outlook to Notes, then the software enlist all mailboxes to preview to users. Users can select any Outlook mailbox and convert its contacts in Lotus Notes. The software is developed technically that does not alter any of the properties of contacts while converting from Outlook to Notes. All the custom fields of Outlook contacts will be automatically mapped with Lotus Notes NSF file. Users can save Outlook converted contacts either in existing Names.nsf file or can maintain the contacts record in new NSF file. This provides them opportunity to place a choice to save Outlook PST contacts to Notes format according to personalized needs. Preview report is exhibits to the user when the tool expot contacts fom Outlook to Lotus Notes, this includes number of contact being converted, size and current folder being processed etc. This gives an idea about how software works and how time is estimated to convert its contacts. Why Investing In Outlook Contacts To Lotus Notes Will Be Worthy? Does software support conversion of contacts from corrupt Outlook PST file? Is there any provision to select two mailboxes at a time to export contacts? No, You can select only one mailbox at a time to convert its contacts in Lotus Notes file. Will this tool work on latest Windows 8.1 version? Can we use Unicode PST file with tool to export its contacts in Lotus Notes? How much time will software take to execute Outlook to Notes conversion? It totally depends on size of your Outlook PST file and number of contacts, if you have few contacts it will be accomplish fast and similarly if you have bulk contacts it might take some time accomplish.